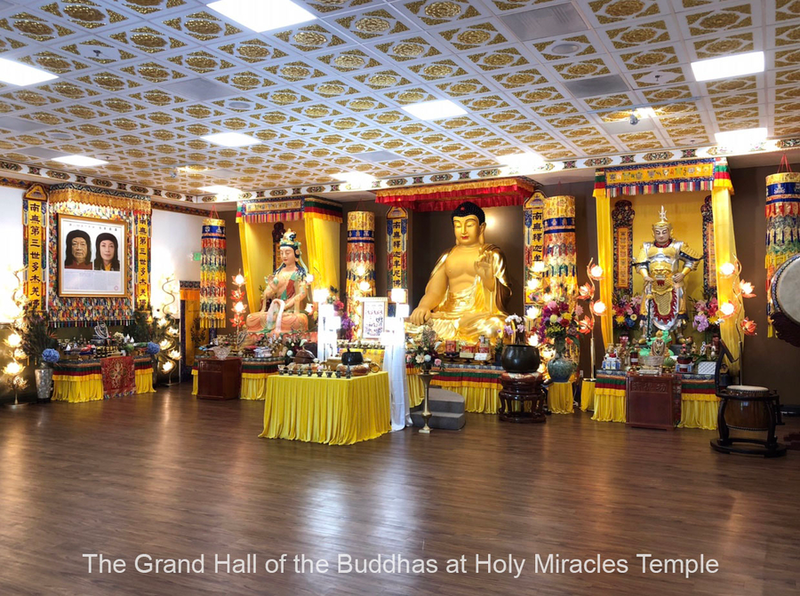 (Reported by Nangqiong Nuosang) On September 19, 2018, one of tremendously holy virtue conducted a “Holy Fire-Offering Dharma Assembly” that was officially held at the Holy Miracles Temple in the United States. The dharma assembly took place at the Grand Hall of the Buddhas and the courtyard right outside the hall. It was a complete success. The attendees of this dharma assembly, which is extremely rare and almost impossible to come by, attended under two types of karmic conditions. Under the first type of condition, there were direct attendees who are persons of holy virtue, eminent monastics, abbots of Buddhist temples, and leaders of Buddhist organizations. Their attendance was determined by a Yu-Zun, Wang Zha Shang-Zun, Mozhi Jiao-Zun, or Dharma King Gar Tongstan. Under the second type of condition, there were attendees whose attendance accorded with karmic conditions. They encountered the occasion by happenstance and hence attended the dharma assembly. During this holy fire-offering dharma assembly, good and faithful Buddhists sat on both sides of the Grand Hall of the Buddhas. With watchful eyes, they personally witnessed in close proximity the whole process of that dharma assembly. The fire-offering mandala involves the use of numerous different dharma instruments. A cauldron was newly made for the fire-offering mandala just in time for the dharma assembly. It was a clean cauldron made of pure copper, with no electrical or ignition device inside. A flat table and all the dharma instruments, including the fire cauldron, were wiped thoroughly clean from top to bottom by more than ten volunteers on site. The fire cauldron was placed on that flat table. Pieces of sandalwood were put inside the cauldron. The table was then moved closer to the door of the Grand Hall. A Buddhist disciple took the initiative to place the vajra demon-subduing bowl, which is used in a holy fire-offering, upside down on a small flat table. According to the meaning of the dharma, demons and evil karma from everyone attending the fire-offering are collected and subdued inside the bowl. The demons tried in vain to escape from the bowl, using all of their strength to shake the bowl. At this critical moment, a sound of “Hong” was heard! Vajra Maternal Buddha launched a flash of lightning, turning all the malicious demons and black karma inside the bowl into pulverized powder. The souls of the demons were brought to a Buddha-land by Buddhas and Bodhisattvas to be edified under rigorous discipline. Such were the extremely wonderful holy miracles from the holy homa fire-offering. The good and faithful Buddhists attendees were very moved. Even the well-known Mozhi Jiao-Zun lost his calm. He was so excited that his facial expression looked twisted. Everyone did their utmost to present offerings to the one of tremendously holy virtue, but the one of tremendously holy virtue did not accept even one cent, and simply told everyone to keep their offerings.